In May 2016, more than 1,700 students representing 75 countries, regions and territories will be in Phoenix, AZ for the Intel ISEF – to compete for more than $5 million in awards, scholarships, internships and prizes. These high school students are the top winners of regional, state and national science fairs from around the United States and the world. 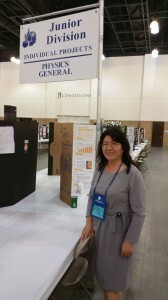 Areteem faculty members Dr. Kevin Wang and Ms. Kelly Ren have been chosen to be among the judges who will be supporting the young scientists of the Intel ISEF. They will engage in meaningful discussions with the student finalists. Judging is the single most important activity at the Intel ISEF and determines the distribution of millions of dollars in prizes, according to the judging committee. The judges’ objective evaluation of projects is the most important aspect of the fair and determines the distribution of millions of dollars in prizes, according to the judging committee. The judges’ objective evaluation of projects is the most important aspect of the fair and determines the distribution of millions of dollars in prizes, awards and scholarships. Many people may not realize that Mathematics (Algebra, Analysis, Combinatorics, Graph Theory and Game Theory, Geometry and Topology, Number Theory and Probability and Statistics) is in fact one of the 22 major categories students are competing in. We are looking forward to hearing Dr. Wang and Ms. Ren to share their insights and involvement at the Intel ISEF to our students at the Areteem summer camp. Students will learn first-hand information as to what it takes to launch a winning project for prestigious Science fairs.